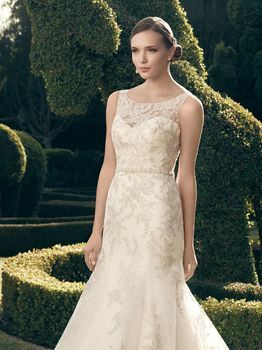 Non-beaded embroidered appliqués on tulle over Sequined Tulle sit on top of a layer of Gossamer Tulle with a Sleek Satin lining create this gown. The sheer front neckline and keyhole illusion back add just the right amount of coverage. Godets in the front and back skirt add fullness to this fit and flare silhouette. A detachable ribbon sash with silver beadwork accents the natural waist.